Mango Tree BGC, its flagship restaurant, reopens with a fresh and significant design with an all-new menu. It's indeed a lot different from the old look. 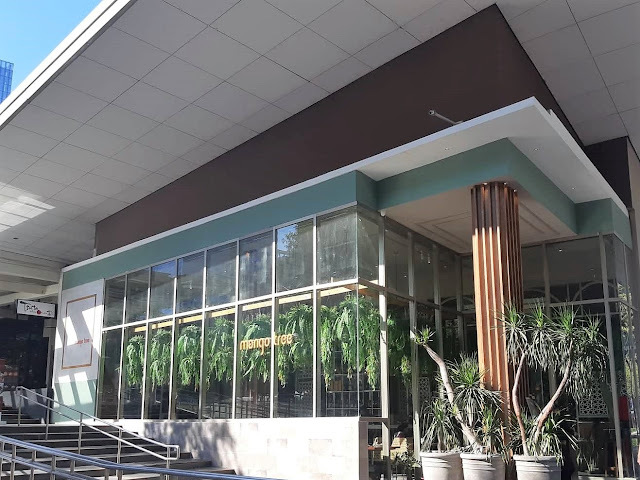 Personally, it's better, fresher, and with a more relaxed look which will attract more diners catering to a wider market including families, business men and women, and working people around the BGC area. It's expanded its reach not only to those looking for authentic Thai dishes but even those who just want to find a place they could feel cozy and relaxed while devouring delicious food and enjoying conversations with their companions. Diners will now enter through the casual elegance of the solarium and immediately see the stylish bar, which connects to a high-ceiling restaurant with plants and greenery offering a sense of escape and tropical tranquility. It also features a stunning show kitchen, a special wine room, and semi-private booth seats ideal for restaurant views. loft area that has been enclosed for private functions. I had a pleasure dining with food and lifestyle bloggers and was so happy to see Rina or rinasrainbow.net and her beautiful daughter Rain. I came with my two younger boys that beautiful Saturday afternoon. The new Mango Tree also has a new menu that reflects the increasingly adventurous appetites of modern diners. So this well-loved Thai restaurant has something both for the "purists" who want the traditional Thai taste, and the "adventurers" for those who seek to go beyond boundaries and who are in constant search of new Thai tastes. We had a chance to taste their new menu offerings and my 8yo boy had his favorites! Whenever this little boy diner likes a dish, it means a lot to me because it just proves that the restaurant is worth a visit not only by matured diners but the whole family too! Shrimp Cakes - as the name suggests, it's shrimp-based dish which is child-friendly. My kids liked this a lot! They treated these like nuggets which they ate together with steamed rice. Enjoyable both for kids and adult. (Tangmoo Goong Haeng), a refreshing palate cleanser of fresh watermelon and shrimp floss mixed with a tad of sugar. Steamed Chilean Black Mussels in Tom Yum - Mussels may not always be my favorite, but it's my go-to seafood when I get tired of eating pork, beef, or chicken. This dish is a must-try and definitely something with an adventurous taste would be happy about. Grilled U.S. Pork Belly (Kor Moo Yang) - marinated grilled US pork collar served with Isan jim jaew sauce. I love pork belly and I enjoyed this dish with my generous serving of rice! Winner combination! My sons loved it as well! Stir-fried Crab in Curry Sauce (Phad Phong Ka Ree), a simple yet delicious crabmeat dish with egg and yellow curry sauce. Who doesn't love curry? I don't know any, if you don't, then you must be missing a lot on food enjoyment! This dish is spicy but flavorful! If you're a carb lover like me, you could pair this with your ever dependable rice or noodles too. Stir-fried Rice Noodles with Crab Meat - If you want to go for Mango Tree's main dishes, make sure you make this part of your order. The combination of fresh seafood, salt, spice, rice noodles and veggies - would give anyone a burst of legit Thai flavorful experience in your mouth. Stir-fried Lady Finger "Okra" (Okra Fai Daeng) which is topped with garlic, bird's eye chili and yellow bean paste. I am happy my vegetable-eating Wes loved this Mango Tree recipe. He loves eating okra and usually it's with a soup-based dish. He has never tried it cooked this way, but boy he loved it! He even asked for second serving! If a child likes a not so favorite vegetable, then I tell you it must be really good! Thai Style Mochi - glutinous rice balls with grated coconut and palm sugar. Always always leave room for desserts and that's what we all did. Hence, I appreciated how delicious these little mochis are! Seriously, every dish I tried gave a different gastronomic experience including this simple-outside-but-the-bomb-inside Thai mochis! I finished around four piece of it! Addicting! Glad I left a lot of room for it! Thai Tapioca Dumplings (Sakoo Sai Moo), a street favorite made with steamed tapioca balls seasoned with ground pork and ground peanuts; the Isan Grilled Chicken, deep fried chicken marinated with special Thai herbs served with Isan jim jaew sauce; Tri-colored Mango Sticky Rice, a popular choice with is attractively tri-colored with coconut sauce and fresh, ripe mangoes; and the Tub Tim Grob, irresistible coconut ice cream with red ruby chestnuts. Mango Tree is open 7 days a week, with superb service that is relaxed and friendly. Its team is comprised of competitive individuals whose backgrounds consist of years of experience in the food, restaurant, and catering industries. Events and catering will be a major part of the business and with an already established clientele, it is expected to even grow further. Visit Mango Tree and sample its all-new menu selection now. Mango Tree is located at 7th Ave. Bonifacio High Street Central, Bonifacio Global City. For information and reservations, call (02) 217-2367. Follow them on social media for updates and more info too: Instagram and Facebook.